Barbecue Party Game Barbecue Party is an entertaining kids skill and action game. The game has a basic premise (usually a good thing with kids games!) – players have to turn over a card, look at the image of barbecue food on the card, then find the pretend version of that item among the pile ..
Barbecue Party is an entertaining kids skill and action game. The game has a basic premise (usually a good thing with kids games!) – players have to turn over a card, look at the image of barbecue food on the card, then find the pretend version of that item among the pile of pretend BBQ food, before either placing it on the BBQ or taking it off using a pair of pretend barbecue tongs. The winner is the person who collects the allotted amount of food first, while avoiding the BBQ springing off and spilling all the food! There are several features of Barbecue Party which we really liked/went down very well in playtesting – firstly, the game has a kind of built in memory game, as once a certain item has been placed on the barbecue, even though the cards are moved around, if the player can remember/watch roughly where the card for the item went they can try to find it, and then have a better chance of being able to collect an item from the barbecue. We also really like the level of dexterity challenge/motor skills development with Barbecue Party. While adults may see the physical process of picking up a piece of pretend food with the tongs and placing them on the BBQ as easy, for kids it’s a good test of skill and the process of trying to do it helps them to develop key co-ordination and motor skills. There is a really nice look and feel to the game, with the barbecue itself looking quite funny and cutesy, and the pretend food items also look like fun. Finally, because the game is entirely mechanical i.e. no electronics, the game does not need batteries, so there is no faffing about with screwdrivers etc when trying to set the game up. There is a little set up in terms of putting stickers onto the food items, put kids will most probably find this fun and enjoy the process. 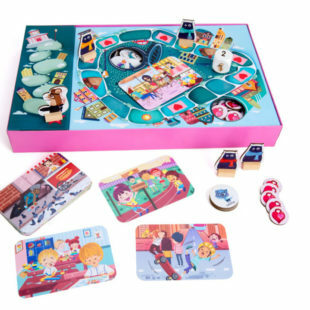 WHO’S IT FOR: The game is labelled as 4+ in terms of age, we think this is just about ok, although kids from 5+ will find the physical skill level needed easier. THE TOY VERDICT: We enjoyed playing the Barbecue Party game, and think most kids/families with kids will find it fun while having a subtle positive developmental impact for children.